The device consists of machines and devices to form a supporting plate made of PE foil , and rotary machines to grind and polish the areas on the surface of the glass semi-finished product. Both machines – the smoothing grinder and the polishing device – are similar, following the same principle: their spindles are situated vertically, and they machine with the front side of the tool, i.e. the front tool plane. The only difference is the tool material: the grinder is provided with a tool made of natural sandstone or carborundum grain with ceramic bond or resinous bond, while the polishing device is usually provided with a resinous tool with polishing constituent. The working area of the tool rotates in the horizontal plane, while the fixation plates are pushed towards the tool by two arms. Each arm is equipped, on its free end, with a rotary-pendulous plate and with a carrier on which the plate with stones is put, or the whole carrier is exchanged after releasing by means of a sliding ring. The input for the arm movement is independent ; adjustment is independent as well. The tool is fixed to a replaceable plate placed on a supporting plate which is bumped on the end of the spindle cone. The spindle is situated in a welded frame, with rolling bearings with permanent grease filling. A part of the frame construction is a support for the main motor, placed vertically in the rear part, intended for vee belts tensioning. 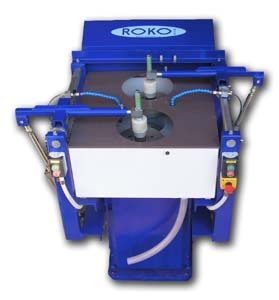 The plate pressure to the tool is provided via a pneumatic cylinder. The pressure power, the approach speed, and contact softness may be adjustable within a wide range via controlling elements of the pneumatic system. You may adjust the contact time of the workpiece with the tool as well, via a timer in the switchboard. The rotating tool is surrounded with a collecting vessel from which coolant is drained, being previously brought above the tool. 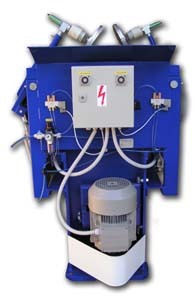 The rotating tool is surrounded with a collecting vessel from which the coolant is drained, being previously brought above the tool by means of two adjustable hoses. During normal operation, the only job for the operator is to replace the fixation plates with the stones: the plates are put on the rotary-and-pendulous part of the free end of the arm. For the purpose of the arm is for the purpose of this exchange, the arm is in a lifted position. In turns, the operator works with the arms of each machine, and transfers the finished plates from the grinder to the polisher arm. After a plate has been put on, the operator pushes the start button of the respective cycle on the panel, the arm gets closer to the permanently rotating tool. After the pre-set time has expired, the plate is released and the arm gets back in the position of replacement; the plate with the stones is taken off and is either transferred to the polisher arm or finished already and put away on a table. Facet-processing machines should be operated by 4-6 operators.